Not only did we all have a restful night checkout was a little later here and breakfast was at 8:30 am. Although it was raining in the morning the rain reduced to a drizzle and we managed to get our things on our bikes and headout. The entrance to the cabins is via a coded chained entrance and we were told to use the same code to get out. Although they might have forgotten to tell us that the exit was in a different location we headed up the same road we came out of and found ourselves on the other side of the key pad. So Ali crossed over by foot and punched in the code and while we crossed I punched in the code again and Ali passed down what we assume is a one way gravel road. 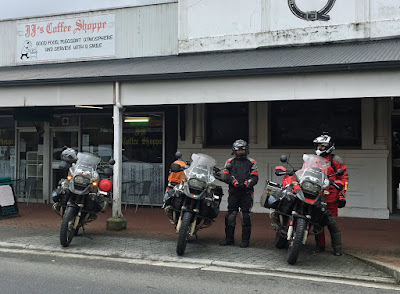 We handed over the keys and headed to Strahan , The vistas were great but the overcast and drizzle made photo opportunities limited, but we managed to get a break in front of a mountain range and took a few photos. We reached Strahan around 2 PM and while Ali and Husain walked to the town center I worked on the blog. Around 5 PM Ali and Husain suggest to walk to a local restaurant for dinner and take in the view before the sun set. A grilled trout and some steamed vegetables later and we were good to go. Tomorrow we head back to Devonport and the ferry to Melbourne.